This entry was posted on March 18, 2019 by valuemailers seo. Polybags are of great use these days since packaging has become an integral part. These polybag mailers are basically containers to hold the stuff that you want to mail or ship to some other location. This is a very convenient way of mailing your items in a proper and safe fashion. There are different kinds of polybags that are now available in the market and one can choose whichever type that would satisfy their particular requirement. One of the types is these Polybag Colored Mailers. Highly Attractive: These Colored polybag mailers aren’t of the ordinary kind. These mailers come in various different vibrant colors that make them stand out and appear highly attractive. A special blend of colors are used to give these mailers a very attractive appearance. 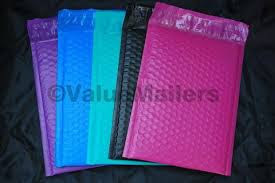 These colored polybag mailers are a perfect fit in case you are mailing something special, such as gifts or presents. Water Resistant: These colored polybag mailers are water resistant, and wouldn’t allow any damage to seep in through it. And even the outer layer wouldn’t be destroyed and the color will stay intact. Tear and puncture proof: Even if the delivery gets really rough, these colored polybag mailers will keep the items inside it absolutely secure without getting torn or punctured. Therefore, you don’t have to worry about its damage free delivery. Strong Adhesive: The adhesive that is applied on the strip of these colored polybag mailers is of very strong and long-lasting quality. It’s highly pressure sensitive and super strong, making these polybag mailers very durable. Even if you keep these colored polybag mailers in your storage for a long time unused, these will still stay absolutely perfect and the adhesive will also not dry. Highly efficient hard mailers: These mailers are highly efficient for mailing a wide variety of items. Its hard structure keeps the items inside secure from getting bent. So, these Color Poly Bubble Mailers are a must have and an amazing option for mailing your items in a more attractive and secure way.